The Qatar Philharmonic Orchestra, an ambitious musical project adding musical reach to the Doha audience, announced the appointment of its new music director, Han Na Chang. The new director will succeed the current Music Director, Michalis Economou in September 2013. Chang gained international recognition at the age of 11 when she won both the First Prize and the Contemporary Music Prize at the Fifth Rostropovich International Cello Competition in Paris in 1994. Since then, she has built a history of over 20 years of music career concerts as cellist in numerous international halls with many orchestras. 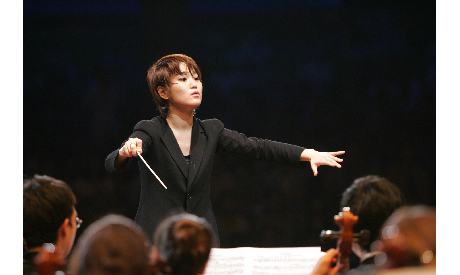 In 2007 Chang made her conducting debut in Korea and ever since dedicates herself to conducting. The new appointment as Music Director of the Qatar Philharmonic Orchestra is definitely an important step in Chang's career. The Qatar Philharmonic Orchestra was founded by Her Highness Sheikha Mozah Bint Nasser Al-Missned in 2007, with an aim to attract the crème de la crème of the music world to Qatari audiences, through a selection of well-chosen repertoire and renowned in-house artists. One of the important pillars of the orchestra is its Artistic Director Marcel Khalife, an internationally-known Lebanese composer and oud player. Today, the orchestra consists of 101 members chosen through a series of demanding auditions. With Eugen Bold from Romania as the konzertmeister, the musicians represent a melting pot of over 30 nationalities, including musicians from Germany, Hungary, Austria, Bulgaria, the Czech Republic, Ukraine, France, Italy, UK, Russia, Uzbekistan etc. The orchestra has also eight musicians from Egypt. The orchestra has toured extensively, giving concerts in venues such as the Royal Albert Hall in London, the Kennedy Centre in Washington, Teatro alla Scala in Milan, Théâtre des Champs-Élysées in Paris, the Konzerthaus in Vienna for the 50th anniversary of OPEC and the Syrian Opera House in Damascus, among others . Since its creation, the orchestra hasn't had a resident conductor. The music director is involved in the orchestra's musical day-to-day development and growth and conducts a large number of the concerts. The orchestra is also conducted by many international guest conductors. Egyptian conductor Nader Abbassi was the first apponted Musical Director of the Philharmonic. He was succeded in September 2011 by Michalis Economou from Greece. As announced on 10 December, starting September 2013, Han-Na Chang will take over those responsibilities. At 30 plus years of age, Chang welcomes the appointment as music director of the Qatar Philharmonic Orchestra with great enthusiasm. When asked if the fact that she's young and female could pose any additional challenge in her work as a conductor, she replies to Ahram Online that "What is much more important is what is inside your heart, the state of your spirit." Chang underlines that within her plans is to "expand even more the repertoire of the orchestra, as well as to hold world premiers of important Arabic compositions." It is worth adding that the orchestra boasts remarkable world premieres, such as Marcel Khalifé’s Return Symphony that was performed in 2011-2012 season, as well as premieres of Jean-Charles Gandrille’s Violin Concerto, Abdalla El-Masri’s Oud Concerto, Rami Khalifé’s Chaos for Piano and Orchestra and Houtaf Khoury’s Angel of Light Piano Concerto among others. Chang is no longer playing the cello in any venue. Dedicating herself completely to conducting, before the new season begins, she will be back in June to conduct the Qatar Philharmonic and thereafter will conduct the Qatar Philharmonic more frequently in the 2013-2014 season.